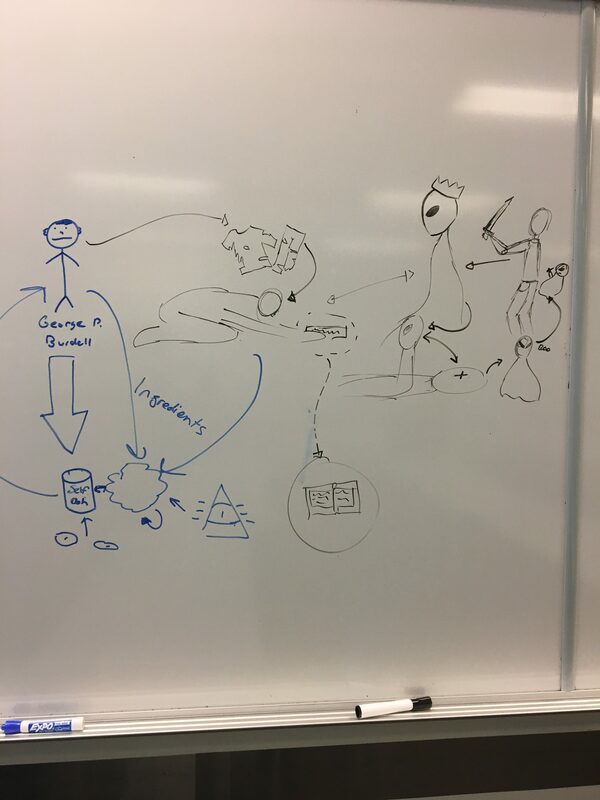 We discussed the introduction to Stephen Greenblatt’s Renaissance Self-Fashioning yesterday. 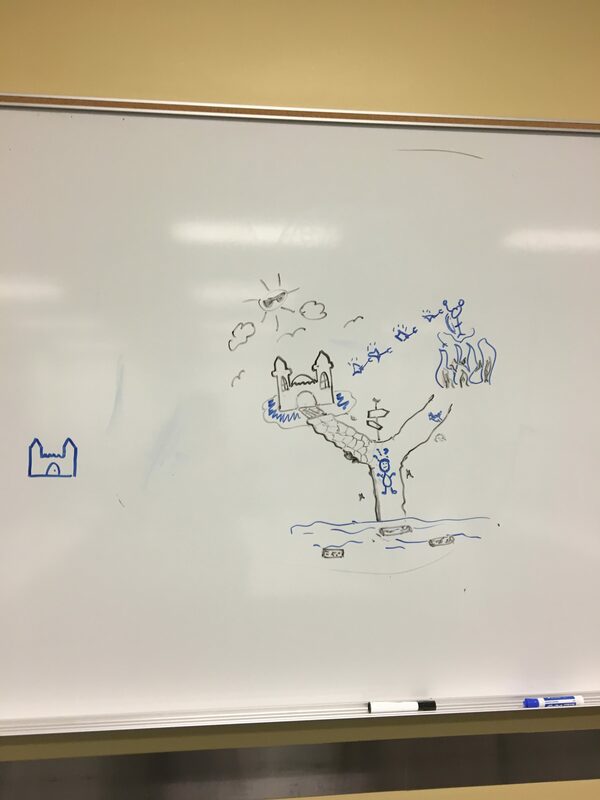 Then, each section formed groups of 4-6 students and drew out a variety of ways to visualize the self-fashioning process, as described by Greenblatt. 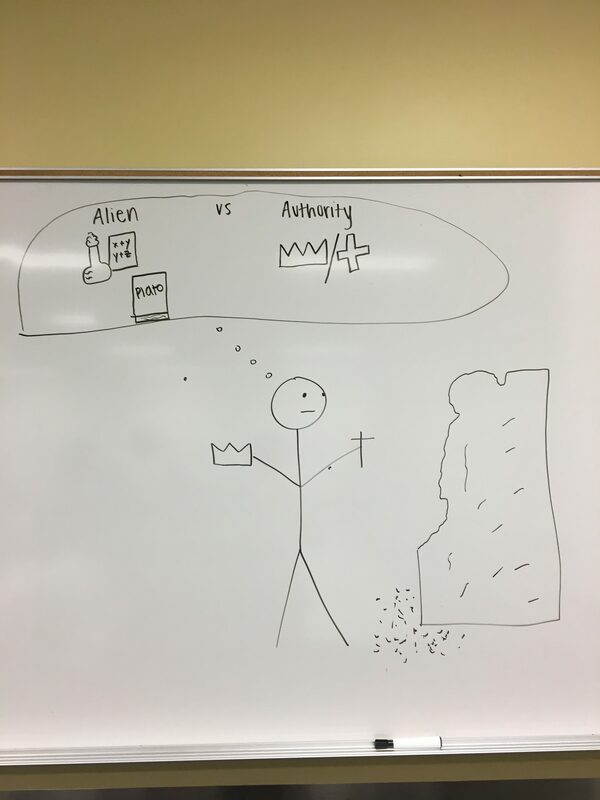 Here are the results of our experiment – note the heavy featuring of aliens and authority (represented in many cases by book, crown, and cross to correspond to Protestant Christianity, sovereignty, and Roman Catholicism) in many of these drawings. 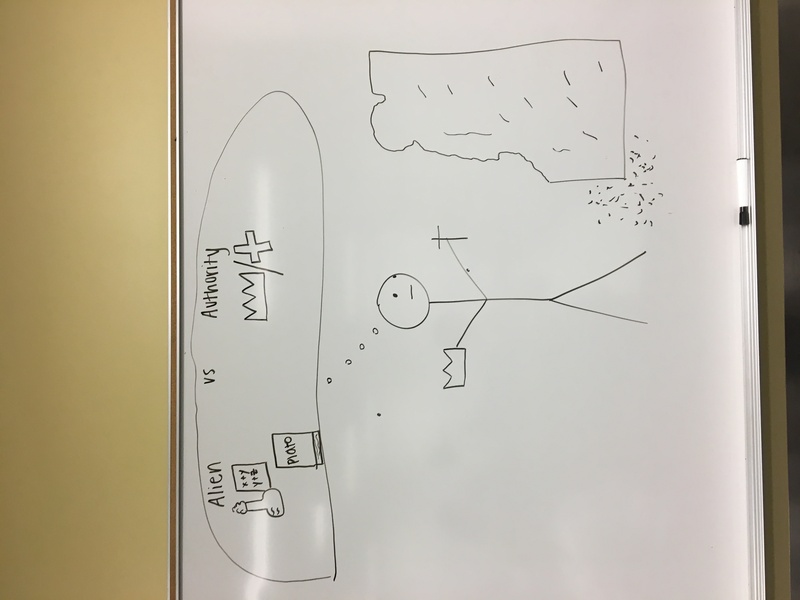 In this drawing, the subject uses a cross and crown to carve a “self” out of a block of marble, while keeping in mind his or her own competing aliens and authorities. 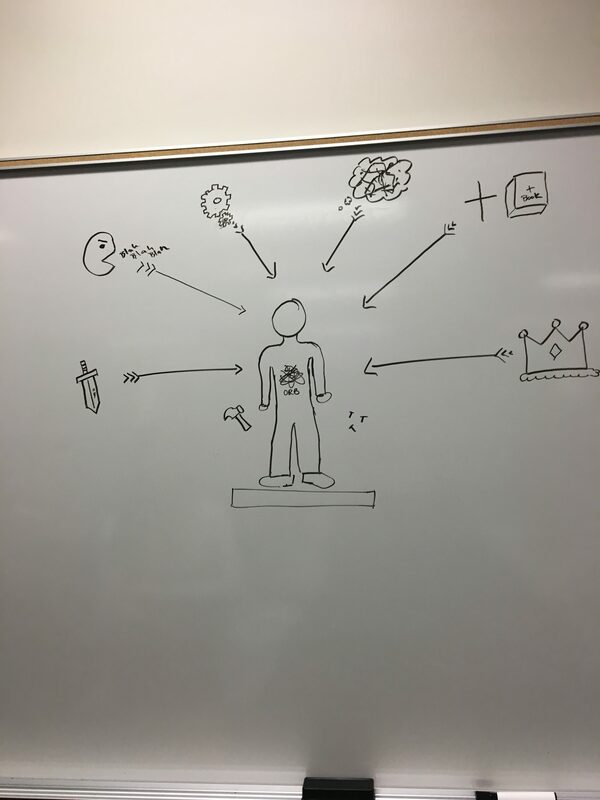 In this image, the “self” stands at the center of a set of competing forces (progress, sovereignty, theology, peers, etc.) and next to a hammer and nails. The face is blank and the center is occupied by an orb of selfy-ness. This in-process self stands at a fork in the road, one branch of which leads toward authority and sunny skies, the other branch of which leads to the alien (who is also shooting fiery darts at the castle). 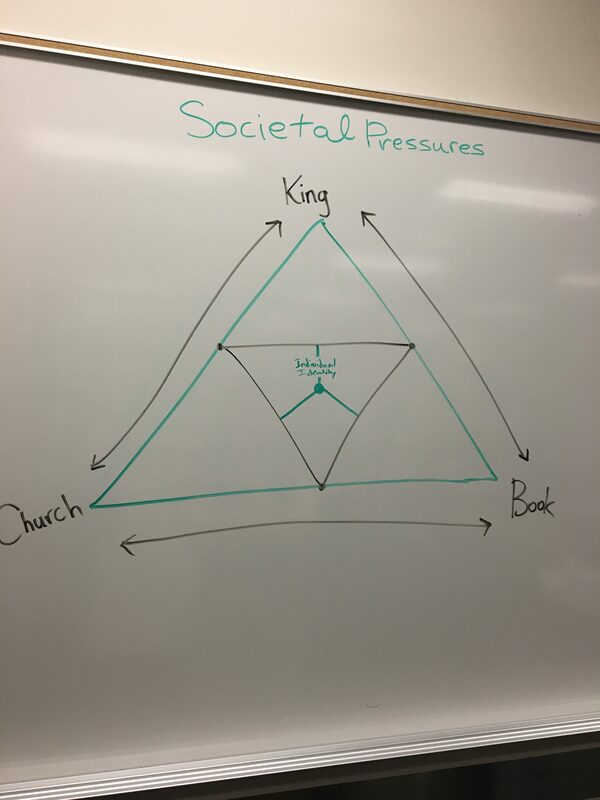 In this visualization, the “self” is thinking about issues of social mobility (represented by the crowns, which increase in size as they go up). The alien fires at the self’s authorities, and this conflict trickles down to inform how the self is making decisions about its formation. This image shows how the authority and alien are slippery categories – one person’s alien is another one’s authority. 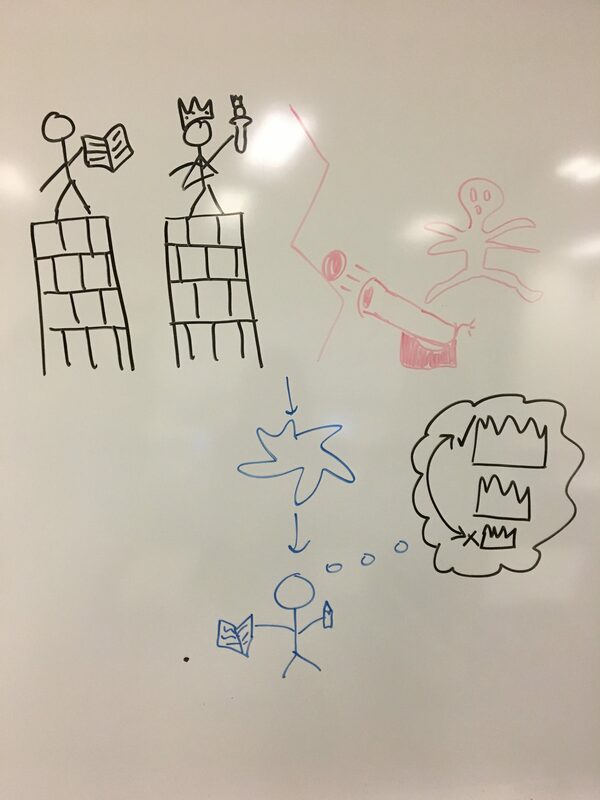 The kneeling figure reads a book, and through literature is introduced to the authority/alien figure. Meanwhile, George P. Burdell looks for some “Self-Doh” to craft his identity. 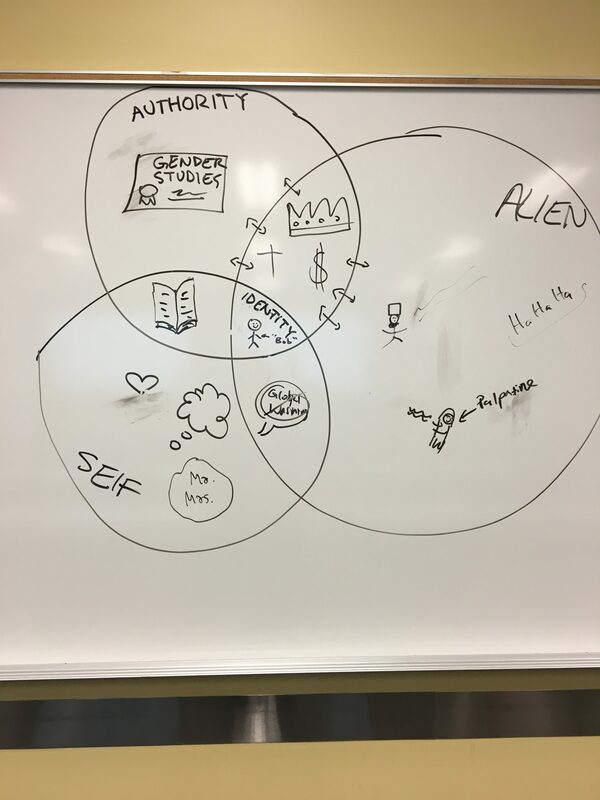 This diagram shows the overlapping forces of authority (represented by a diploma in Gender Studies, God, sovereign, money, and a book), the alien (represented by Emperor Palpatine), and the self. In the middle is depicted the formed identity.